Improve toy wheel traction with brush-on rubber coating. Aging plastic toys often experience poor wheel traction due to a loss of rubberized treads. This lack of grip makes RC vehicles and home brew robots difficult to operate, and can damage expensive components. Many hobbyists fix the problem with pricey custom replacement parts. Instead of resorting to this costly, time-consuming process, add traction to your existing wheels with an inexpensive quick fix. Find a smooth, flat work surface in a dust-free area. Cover the work surface with newspaper. Thoroughly scrub your toy’s wheels with dish soap and a toothbrush. Rinse off the soap and allow the toy to dry completely. Place your toy on its back so that its wheels are completely accessible. 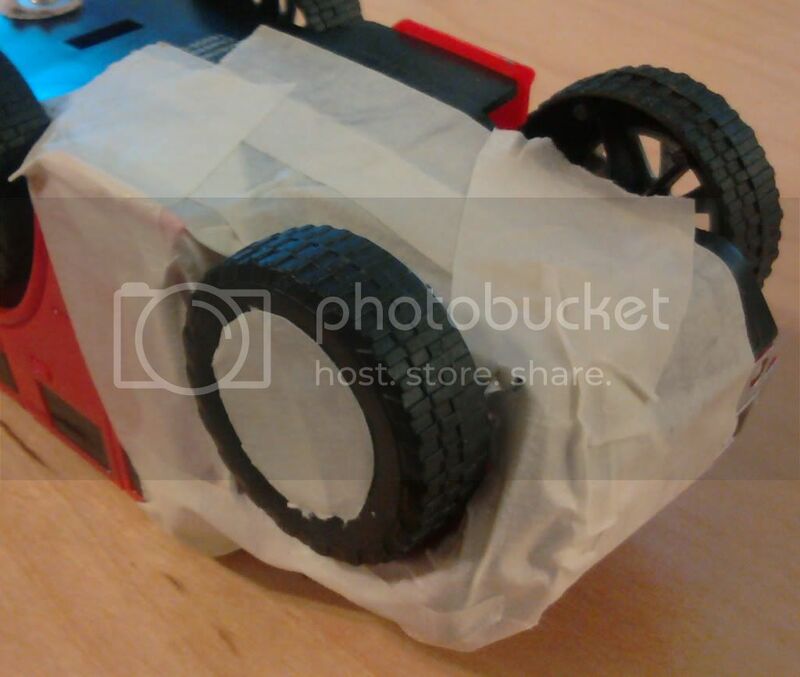 Cover the wheel well, axle and wheel rim of your toy with masking tape. Leave only the tire area exposed. Wipe the wheels with a soft cloth and rubbing alcohol to remove any oils left behind by your hands. After you have applied the alcohol, do not touch the wheels. Wearing latex gloves, apply a thin layer of a synthetic rubber coating to the exposed area of each wheel with a small, disposable, soft-bristled paintbrush. Allow the rubber coating to dry for eight hours. Repeat this process at least two more times to build up a durable rubber coating on your wheels. Use a new brush each time. Carefully remove the masking tape. Remove any excess or uneven rubber coating with a craft knife. Coat the front and back wheels in different colors to monitor wear patterns. Try creating rugged, off-road tires for your toy by sprinkling fine grain sand on the wet rubber coating between the first and second applications. Fumes from brush-on rubber coating can irritate lungs and airways. Wear a respirator if you have a sensitive respiratory system. Only use craft knives under adult supervision. Amanda Flocke is a freelance writer and artist based in Houston, Texas. Her broad range of expertise includes green living, interior decorating, woodworking and primary education. Flocke holds a Bachelor of Fine Arts in sculpture from the University of North Texas.